PeopleACT is an UndiMsia! intiative. It is run by a group of human rights defenders from different organisations. Its mission is to make the cyber environment a safer, more respectful and empowering space for Malaysians through law reform and public awareness campaign. As part of our research effort on cyber harassment, we invite you to participate in our online survey (English and Malay) and screenshot crowdsource platform to help us document incidents of cyber harassment in Malaysia. Members of the public who have a keen interest on issues relating to cyber threats/harassment are most welcomed to join the group. Check UndiMsia Facebook page and Twitter account for updates on PeopleACT. Kindly contact Mazni Ibrahim at [email protected] or call 03-2201 1454. For more information on the project, click on the concept note in English and Malay. Join UndiMsia! to call for Malaysian lawmakers to act against cyber harassment and bullying. Infographic: Ada apa dengan parlimen? 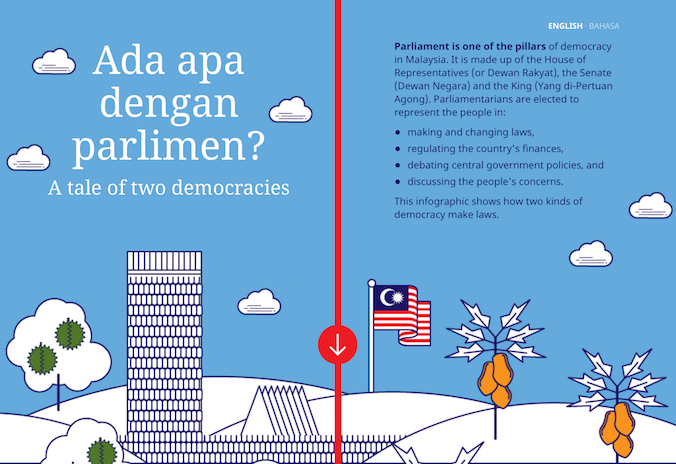 Comments Off on Infographic: Ada apa dengan parlimen? 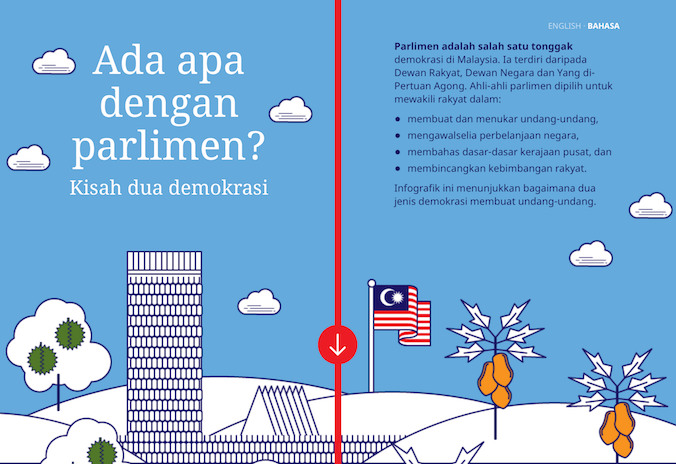 Learn how Durian Democracy and Papaya Democracy make laws in this web infographic. Pelajari bagaimana Demokrasi Durian dan Demokrasi Papaa menggubal undang-undang dalam infografik web ini. Comments Off on Tak Mau Denggi! Animasi ini menceritakan tentang masalah-masalah yang dihadapi oleh masyarakat Orang Asli dan bagaimana mereka mempertahankan tanah dan wilayah adat mereka. Diadaptasikan dari buku komik ‘Kartun Kisah Pemetaan Komuniti’ karya Abri Yok Chopil & Sinui Pai Nanek Sengik (SPNS), terbitan Pusat KOMAS. Video ini adalah hasil produksi bersama UndiMsia! dan Pusat KOMAS. This animation tells the story of the struggles of the Orang Asli and how they defend their rights to their ancestral and customary land. It is adapted from the ‘Kartun Kisah Pemetaan Komuniti’ which was originally written by Abri Yok Chopil and Sinui Pai Nanek Sengik (SPNS), and published by Pusat KOMAS. This video is co produced with Pusat KOMAS. Dirakam di Perayaan Hari Orang Asal Sedunia Malaysia 2013 di mana Orang Asal dari seluruh Malaysia berkongsi pendapat mengenai hak-hak orang asal yang tertera dalam Deklarasi Hak Orang Asal Antarabangsa (UNDRIP). Recorded at the 2013 National Indigenous People’s Day Celebration, Orang Asal communities from all over Malaysia shares their experiences and opinions about their rights as outlined in the United Nations Declaration on The Rights of The Indigenous People (UNDRIP).